It's been awhile! I had ankle surgery shortly after that last blog post in 2012, and didn't think it was a good idea to blog while on pain meds, lol.... and then apparently got completely out of the habit. I've had a number of surgeries/recoveries/medical problems in the last 3 years and through all of that, I think it was just easier to not blog. That's it in a nutshell. But I've missed you all! I wanted to let you know we've updated the website and done some cleanup on it.... so if you haven't checked it in awhile, be sure to pop over there and check out the new items. For March, we've added instructions for 5 new "featured projects", and coordinating merchandise in the "Sale" category. We've also updated the recent flyers, click HERE to check those out. Click on the image below to visit the website. I'll be posting a free giveaway next week, so please check back here on the blog to win some brand new FREE products. Thanks for stopping by, I've missed you all! Wow, been a long time, huh? I've been swamped trying to get all of my new CHA products ready. I'll be sharing some of those with you in the coming weeks. In the meantime, I thought I'd share a cute little paper flower that coordinates with one of my new products. I designed a number of flat back "tin pin" buttons that I wanted to use for flower centers and embellishments on a variety of projects. I was trying to find a different type of paper flower and came across this flower on Fiskar's website. I adapted it slightly and it turned out to be really cute with my new "tin pins", so I thought I'd share my version with you. The little paper packets used to make these flowers and the "tin pins" will be available soon on my new website. We're hoping it will be ready by the end of the month (or shortly thereafter).... so be sure to check back for exciting news and specials for the Grand Opening sale! 2. Fold each square of paper in half. 3. Fold each square in half again. 4. Repeat Steps 1 and 2 for all 6 squares. 5. 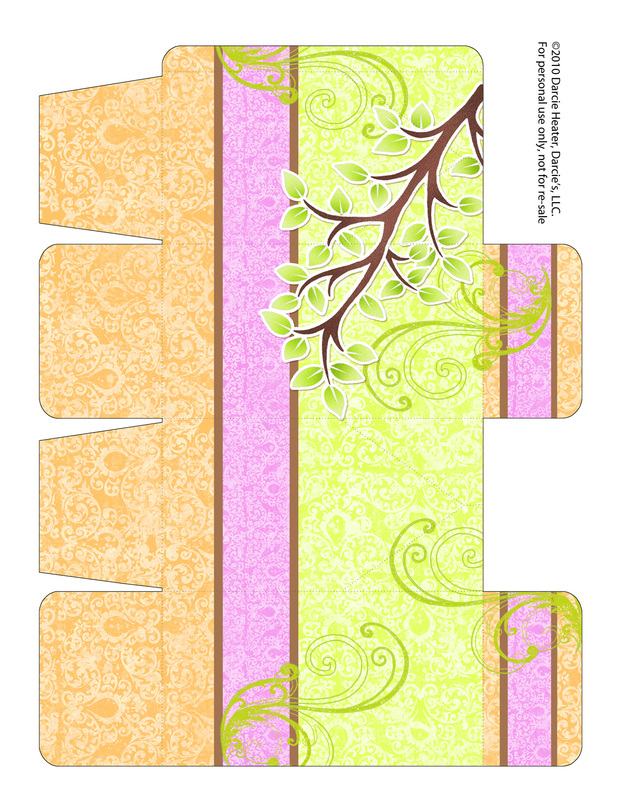 Using the Fiskars 3-in-1 corner punch, punch the corners of the large squares with one of the designs on the punch. Punch the medium squares with one of the other punch designs, and punch the smaller squares with the third punch design. 6. Using the fold lines as a guide, cut on the fold lines, stopping 1/2” from the center of the paper square. Repeat for all 6 squares. 7. Fold each of the cut lines as shown below. Repeat for all 6 squares. 8. Punch a scalloped circle from a coordinating paper for the flower center. 9. Use an Ink Blending tool with a foam pad to apply Distress Ink to the edges of the folded squares. Apply to the edges of the scalloped circle also. 10. Apply permanent adhesive to the center of the largest square. (The photo shows using a permanent adhesive tape runner, but actually using Ranger's Glossy Accents to glue the layers together forms a more permanent bond). 11. Attach the second large square on top of the adhesive, attaching it as shown below (alternate the petals). Repeat steps 10 and 11 for the rest of the squares, attaching the medium squares next, then the smallest squares on top. 12. Apply permanent adhesive to the back of the punched scallop. 13. Attach the scallop to the center of the flower. 14. Apply double sided foam tape to the back of the flat back button. Attach the button to the center of the flower. I'll be back later this week with a post on the "tin pins" and several "tin pin" FREEBIES! The printable Heart Shaped Treat Box is super simple to assemble. Tonya added a cute tissue paper ruffle to the top edge and a pretty tulle bow to hold the cookie inside the box. I hope you enjoy the little boxes.... I'll post the cookie recipe and instructions before the weekend so you'll have a goodie to put inside. I'm also hoping to receive some of the new stamp sets to give away before too long, so check back! I have several recipes to share with you over the next couple of weeks or so, all yummy goodness. I'm wondering why I'm torturing myself, though... we're going to go visit our son (who recently returned from Iraq, yay!) in Hawaii soon and I've been trying to diet. (Yup...still trying to work off the Chocolate Coconut Macadamia balls from the last trip, lol!). So just so you know... you guys really are worth it! If you're interested in making the project, you can click HERE, HERE, HERE, and HERE for the posts that featured the book project tutorial, free patterns and recipe card. For other recipes that fit inside the book click HERE, HERE and HERE. I'll be adding many recipes between now and the holidays, so that you have a complete project you can hopefully use as a holiday gift. AND! Here's the sheet of owl label cutouts you can use on the clear bag shown in the photo at the top of this post. Just print the sheet on bright white card stock and cut out the images. Layer with double sided foam mounting tape, then attach to the clear bag. The clear bag will fit inside the printable gift sack, or you can use the clear bag of goodies separately as a quick and easy gift for someone special. Same as above, the cutout file is a pdf. You can click on it and it will open in a new window which you can print it from. I'll be sharing some Owl Cookies with you in a few days, so be sure to check back! It's October, and time to start on those baking projects, Halloween and Fall goodies.... and holiday gifts (and new CHA images, yikes....)! 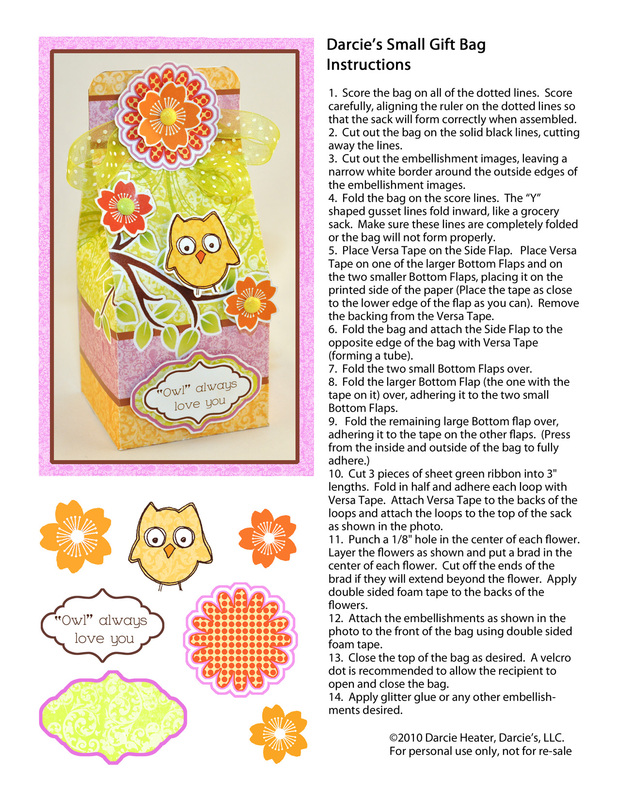 You can print the cute little owl bag, the embellishment images and the instructions by clicking on the photos below. The finished bag is just the right size for some Fall goodies for someone extra special! Click on the following two photos and the images will open in a separate window. Print them on 8 1/2" x 11" card stock. OR, if you prefer to download pdf's of both sheets, you can do so by clicking HERE and HERE. To view a pdf you need to have Adobe Acrobat Reader installed on your computer. If you don't have Reader, it's available as a free download on Adobe's website. Just because you're special! I hope you have a great weekend! I'm a couple of days late posting this.... had a power outage two days ago and computer problems yesterday, sheesh! We had a big storm roll through here day before yesterday and had hail the size of pennies, yikes. I'm headed to the computer store today to have the computer fixed... it's completely dead. Nuts! Ted and Tim crack me up in this one.... lol. I was concerned that something was wrong since there hadn't been a post. Your family is in my prayers and I hope a speedy recovery comes quickly for your husband and his mother. OK, if all of you will please send me your mailing addresses, I will send you your charm sets... along with a couple of U-Cuts that coordinate with some of the charm shapes. :) Please send your addresses to me at darcieheater@gmail.com, by next Friday, August 27, so that I can get them right out to you! Well, last week was a really long one for me with the ankle injury... but I got through it and it's finally starting to make progress. I finally figured out a way to work at my computer and keep the leg elevated. It's propped up on my desk next to my keyboard with ice on it. And YES, it looks ridiculous and is killer on the back, but it does help a lot. No, I'm not going to share that picture with you (! ), lol. It's bigger than it looks in the photo, and has 3 little waterfalls. We had a huge waterfall and pond at the house we lived in previously (which Dan also built...kind of his thing), and our grandsons loved it. So I figured a little fish pond by the front door would keep all the little guys entertained. You can see the little baby koi in the top center. Dan is going to build a great big one in the backyard... probably next year... one project at a time! We recently moved into a new house with no landscaping... so it's been a constant project. SO! I was able to get a lot of work done this weekend toward the new CHA releases, which I can't wait to share with you. Soon. I'll share the dimensional projects from this set with you on Wednesday and give you some more details. AND I'll tell you how you can WIN THIS RUBBER STAMP SET FOR FREE! Loved meeting you at the Arlington Show, and learning about your web page and your crafts. Loved looking at all the neat things on your pages. Found it very easy to look around. Thanks for thinking of your customers. Oh yes and THANK YOU for the cute Make and take...... So easy and cute. Woohoo! Lynn, Connie and D'Arcy, please email me with your mailing addresses and I'll send you a free sampler pack of some of my newest papers. You can email me at darcieheater@gmail.com. Thanks so much friends, and thank you for all the well wishes, I really appreciate it! If you want to download the printable pages in an easy to print pdf format, you can click HERE, and HERE, and HERE. To open a pdf document you need to have Adobe Reader installed on your computer. If you don't have Reader, it is available as a free download on Adobe's website. When the website opens, just click on the tab that says "Get Adobe Reader". Print each of the pages on a bright white cardstock. It's pretty quick and easy to assemble and makes a great way to present someone special with a little homemade treat, or a small gift. Be sure to check back, I'll be showing you the stamp set that coordinates with this project and will be having a FREE DRAWING for that stamp set. Sometime in the next couple of weeks I will also be randomly drawing names from comments on various posts and having an instant winner freebie, so be sure to leave a comment on the recent posts to be eligible for those drawings. I hope you enjoy the project and I'll see you soon! Thought I'd share a quick and easy little project with you. This little acrylic project is from my new line of acrylic frames. It includes a piece of backing chipboard, an acrylic shape (covered with blue film to protect it in the package). The holes are pre-drilled. If you want to add more holes, the Big Bite Cropadile will punch through the acrylic. You can embellish these little frames any way you want.... use beads and wire or ribbon to make a little hanger or dangle beads or gems from them. This set retails for $24.95. (The actual size of the whole set is 5 1/2" x 8 1/2"). If you're interested in ordering any of the products shown here, you can do so by calling our toll free number 1-(800)-945-3980. The newer items are not shown on the website, as it is under construction, we're starting over with a brand new site. I bought some stuff at the stamp convention at Southfield this past weekend. I hadnt seen your store in a while. Wowza! You sure have changed!! I love my older stuff but you sure did a 360 on some of the items and I am loving it. Even my daughter who doesnt like a whole lot of stuff bought some. So glad I took her shopping. Sooo, Jan if you will email me with your address by Friday May 28 to claim your prize, I'll get it right out to you. You can email me at darcieheater@gmail.com. OK, stay tuned for more projects... and another Freebie, coming soon! I think it's time for another recipe to put in the book we made in THIS post and in THIS post. This is my oldest grandson's favorite meal... homemade Sunday morning pancakes. He used to spend the night with us every Saturday night and the pancakes were always a must on Sunday morning. He and his family moved away recently, so I haven't made these in a few months.... but I thought maybe you'd enjoy them also. You can download an easy to print pdf version of the recipe by clicking HERE. You need to have Adobe Reader installed on your computer in order to open pdf files. If you don't have Reader, it's available from Adobe as a free download by clicking HERE. Once the Adobe website opens, click on the tab that says "Get Adobe Reader". OR, you can click on the picture of the recipe above and it will open in a new window. You can print the page from the new window. I hope you enjoy the recipe and I hope you're enjoying some beautiful Spring weather!